First-ever National Symposium on Evidence Synthesis begins today in New Delhi. The George Institute and Campbell Collaboration join hands to promote the use of evidence synthesis in medicine, public health and social development. 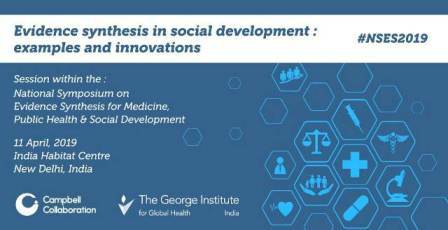 New Delhi, To inform public debate and better policies in diverse fields of medicine, public health and social development, the George Institute for Global Health and the Campbell Collaboration have joined hands to organise the first-ever ‘National Symposium on Evidence Synthesis (NSES) for Medicine, Public Health and Social Development’ on April 10-12, 2019 at New Delhi, India. The science of evidence syntheses has rapidly evolved in the last decade and now inculcates a host of methodologies like systematic reviews, rapid reviews and evidence gap-maps with an increasing focus on knowledge translation supporting government guidelines in the larger scheme of things. Systematic reviews are a rigorous evidence syntheses product that comprehensively captures all relevant evidence but their robust conduct is resource intensive. Rapid reviews, on the other hand, are more tactical in nature to support evidence-informed policy-making and decision-making within the pragmatic constraints of resources. Newer methodologies like evidence gap maps present the spectrum of evidence available on a given topic thus identifying gaps in research and preventing research waste. “There is a growing interest in India, among researchers, practitioners, and policymakers on using evidence synthesis to inform key policy decisions,” says Prof Vivekanand Jha, Executive Director, George Institute for Global Health India.“I hope that the symposium provides an opportunity to all participants tolearn about evidence synthesis across different disciplines of medicine, public health and social development so that we are able to take an evidence-based approach to accelerate the achievement of the Sustainable Development Goals (SDGs)”. 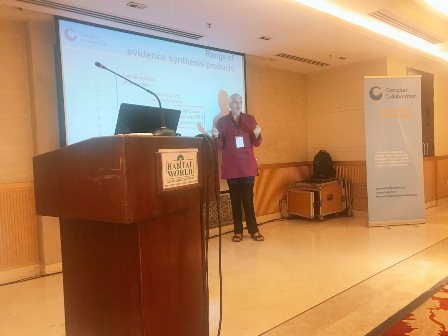 Preceding to the #NSES2019, the two day symposium will be started with a pre-conference workshop on Evidence Gap Maps (EDM) and Integrating Economic Methods in Systematic Reviews facilitated by Ashrita Saran and Howard White of the Campbell Collaboration and Systematic Reviews and Meta analyses in Healthcare led by facilitators from the George Institute today. One of the papers being presented after assessing 51 studies published in India reported among adults the number of epilepsy cases to be 4.3 per 1000 population, dementia as 23.7 per 1000 population. Another paper highlighted that only 16per cent of reports in 136 articles had completed ten steps conducted in outbreak investigations in the period of 2008-2016. Those who are slated to speak at the symposium include Prof Balram Bhargava, Director-General of the Indian Council for Medical Research; Prof Prathap Tharyan of Christian Medical College, Vellore; Dr Anindya Chatterjee of IDRC; Prof Luke Vale of Newcastle University, UK; Dr Pallab Maulik, Director of Research at the George Institute for Global Health India; Dr Howard White, Chief Executive Officer, Campbell Collaboration; and Prof.Dinesh Mohan, Hon. Professor, IIT-Delhi. Dr Howard White, Chief Executive Officer, Campbell Collaboration says, “the last thirty years have seen an evidence revolution which has unfolded in four waves: (1) the results agenda as part of New Public Management in the 1990s, (2) the rise of impact evaluations, notably randomized controlled trials (RCTs) since the early 2000s, (3) increased production of systematic reviews over the last ten years, and (4) moves to institutionalize the use of evidence through the emergence of knowledge brokering agencies, most notably the What Works movement in the United States and the United Kingdom. The National Symposium is an important step toward supporting similar approaches here in India,” he says. The symposium is being supported by a whole host of academic partners that include READ-It, Health Systems Global, The Global Evidence Synthesis Initiative (GESI), Independent Council for Road Safety International (ICORSI), Prof B.V.Moses Centre for Evidence-informed Healthcare and Health Policy, and The Transportation Research and Injury Prevention Programme (TRIPP) at IIT-Delhi.